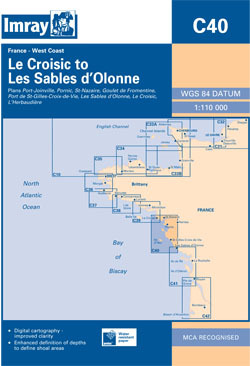 The west coast of France from le Croisis down to Les Sdables D'Olonne. Scale: 1 : 109.000. One-minute gridlines. Larger scale plans of Joinville, Pornic, St Nazaire, Goulet de Fromentine, St-Gilles-Croix, Les Sables d'Olonne, Le Croisic, L'Herbaudiere. Tidal stream diagrams. For this 2014 edition, the chart has been completely revised and updated throughout.